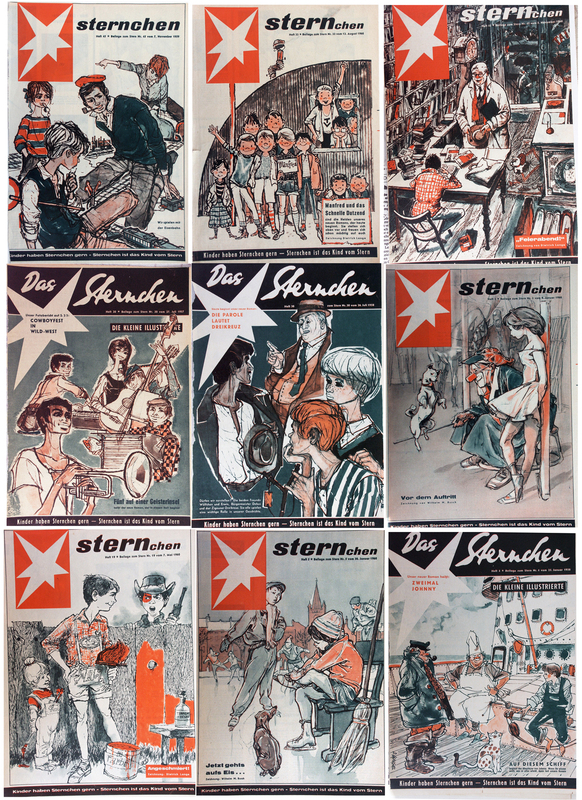 DAS STERNCHEN ( little star ) was an added eight pages children magazine inside the bigger-format german weekly magazine STERN, founded 1948 by HENRY NANNEN. the children magazine started in 1953 and lasted until 1961 when it was changed into a doublepage within the bigger STERN. 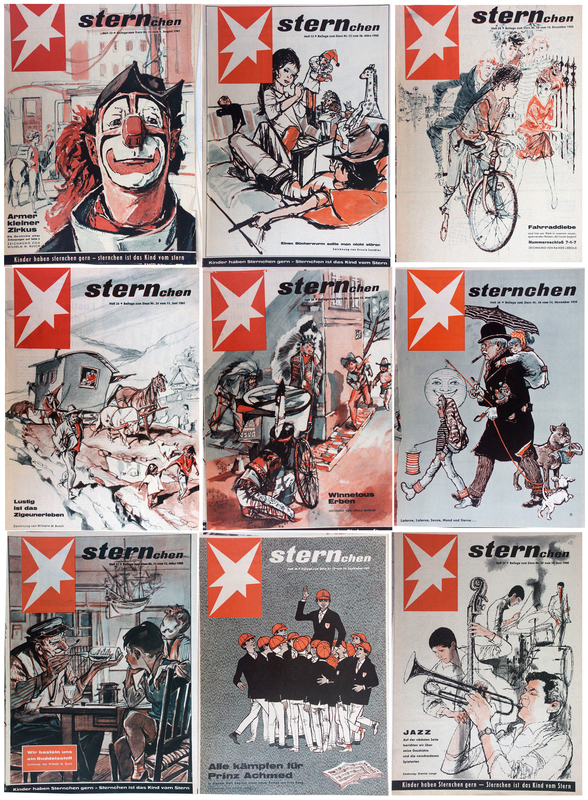 from the very beginning well known german writers and illustrators contributed their art, amongst others ROLAND KOHLSAAT and his series JIMMY DAS GUMMIPFERD ( 1953 – 1977 ) as well as LORIOT with REINHOLD DAS NASHORN ( 1953 – 1970 ). early on my father collected the magazine for me and my brother and bound them at the end of the year into a thick ‘collector’s book’. they were treasures for us and probably they started an interest in illustration and comic strip very early. following I put together a small collection of my favorite covers mostly from the fifties. this post will be the start of a series about GERMAN ILLUSTRATION. 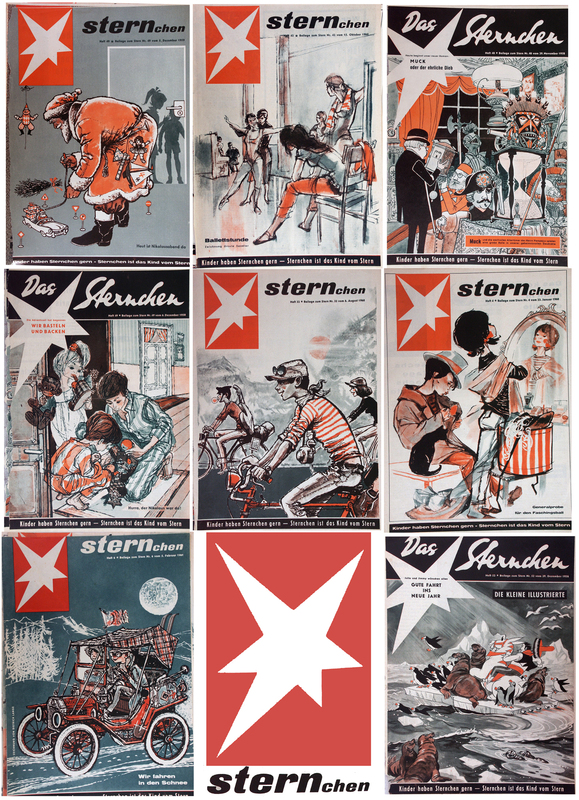 during the last weeks I went through my archives and there are thousands of illustrations from the fifties on. I am sure I am not the only one who is interested in them. so far I haven’t seen any of these treasures anywhere in bookform, what is a shame. Hans, has children’s book illustrator/logo designer Paul Rand done animation? Or been the chief inspiration for any animators? I haven’t seen these for over forty years. They still look beautiful! The Jazz one specially: influenced by the style of David Stone Matin, but that is a good thing.